March 31, 2010 – Personal Protective Equipment can help motorcycle, scooter and moped riders reducing the effects of accidents. 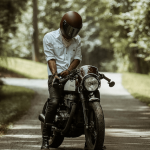 Nonetheless, the benefits of good quality motorcycling clothing are still widely underestimated. With the aim of encouraging a wider take-up of protective gear ACEM, the Motorcycle Industry in Europe, has released a very useful booklet, available in seven languages, with indications on which equipment to choose and why certain types of gear may protect better than others. The booklet was developed within the eSUM Project (see below), ensuing from the cooperation between ACEM and four European motorcycling capitals (London, Paris, Barcelona and Rome). The goal is the identification, practical demonstration and adoption of measures for the safer use of powered two-wheelers in the inner-city traffic. While much is being done on aspects such as vehicle safety features, training and awareness raising, improvements in road safety can be achieved also by promoting protective motorcycling wear adapted to the type and the use of vehicle. Most riders use helmets. However moped riders and commuters tend to neglect the benefits of PPE in terms of safety and comfort. In Mediterranean countries, for example, due to their warm climates, users are still widely unaware that good apparel can combine comfort and safety. The goal of this booklet is to provide some simple guidelines supported by scientific evidence to help increasing the number of motorcyclists equipped with appropriate protective clothing. According to evidence gathered by MAIDS (*see below), riders wearing appropriate protective gear are likely to reduce injuries during an accident. A “Protection Factor” is listed in the booklet for every garment, which indicates the percentage of MAIDS accidents in which the protective gear has mitigated or even better prevented injuries. Knowledge about the benefits of wearing the correct apparel will help users in making the right choice and contribute to their safety. This awareness-raising campaign precedes the 4th Road Safety Action Programme, which should be issued on the 12th of May by the European Commission. The great disparity between Member States in road safety performance and risk exposure for PTW riders shows that with the same line-up of vehicles there are still countries where riding a PTW is considerably more risky than elsewhere in the EU. Closing this gap must be one of the main challenges of the next Road Safety Action Programme. 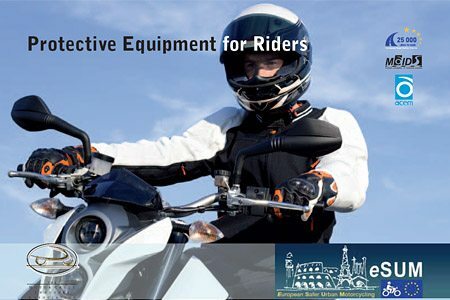 The publication of the Personal Protective Equipment guide is part of ACEM’s commitment to road safety, which follows an integrated approach looking at human factors, vehicle design and infrastructure, seeking to involve policymakers at European, National and local level and other relevant stakeholders. “However in case of an accident, PPE have proven to reduce the consequences of injuries. The PTW industry wants to inform riders about the benefits of PPE and aims at encouraging more and more of them to wear appropriate gear”. The European Safer Urban Motorcycling Project is a collaborative initiative between the motorcycle industry, local authorities of the principal European motorcycle cities and universities to identify develop and demonstrate measures designed to deliver safer urban motorcycling. The project aims at improving diagnosis of the urban PTW challenges, identifying and applying good practices in Urban Motorcycling Action Plans, demonstrating advances in the state-of-the-art, adopting good safety practice through preferential treatment in the implementation of urban traffic management policies and strategies. MAIDS – Motorcycle Accidents In-Depth Study – analyzed more than 900 motorcycle and moped accidents during the period 1999-2003 in five sampling areas located in France, Germany, Netherlands, Spain and Italy. To provide comparative information, more than 900 control cases have also been analyzed in the same sampling areas. The data collected in the MAIDS study represents currently the most comprehensive database of PTW accidents available today. Note: For informational use only. All material and photographs are Copyright © webWorld International, LLC since 2000. All rights reserved.